Microsoft (Windows Phone) and Nokia is in collaboration to build next generation Mobile Operating System for mobile technologies and as we know they both are working on a similar project of Mobile OS called "Windows Phone Mango", So everyone is looking forward to know more about Nokia and Microsoft Windows Phone platform smartphone device, However WMPowerUser, a well-known website has revealed a leak image of Nokia 703, a new smartphone from Nokia and Microsoft which is based on Windows Phone hardware and software. 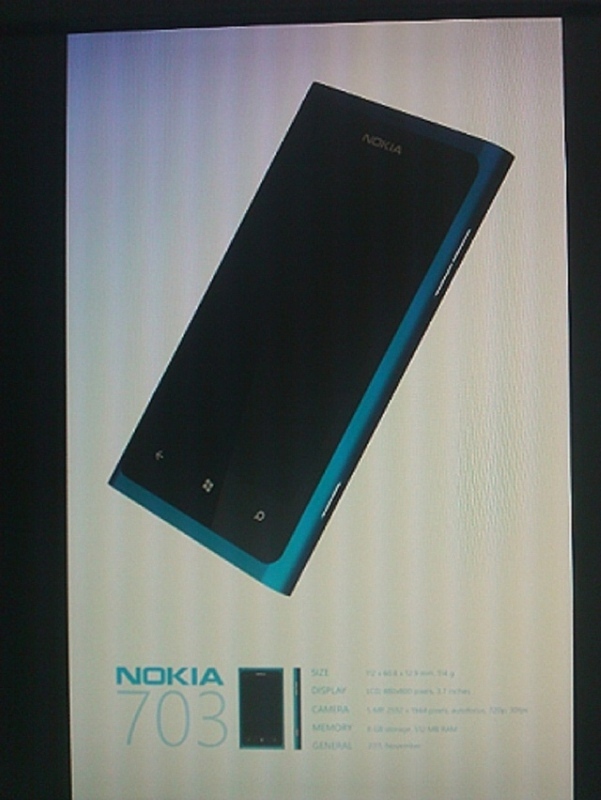 According to the site the upcoming Nokia 703 has built with Windows Phone OS called "Mango". The image was captured from a presentation document prepared for network operators, and reveals some details about its specification, in addition to showing off the form factor, which closely mirrors that of Nokia’s MeeGo-based handset, the N9. According to the image description which can be seen on bottom, the specification of Nokia's 703 is 703 has a 3.7” WVGA (480x800px) LCD, in a form factor that’s 12.3mm thick and weighs 114g. Its slim body houses a 5MP camera capable of 720p recording, along with 8GB of storage and 512MB of RAM. Expect NFC on board as well, given Nokia’s recent confirmation that all of its future handsets will include this feature.